Our students, teachers and staff are making a difference in the community with programs to recycle, reduce waste, save energy and conserve water. MSA and the Federal Environmental Protection Agency (EPA), as well as numerous local entities have recognized VIMSIA’s environmental efforts. The USVI, like states in the mainland, is constantly in need of education funding. A major deterrent to a viable Virgin Islands economy is the high cost of energy. VI energy costs are the highest in the country at 56 cents/kw. An environmentally friendly school that offers an alternative education to public school is much needed. VIMSIA is proud to have been on the leading edge of the solar movement in St. Thomas. Our first 6KW array in 2007 set the stage for what has become a 148KW array in 2017. We put sustainability at the forefront of our campus operations. Water is collected from our rooftops and stored in cisterns - some for drinking and everyday use, some, like the water collected from our solar awning and our parking lot, is used as a grey water irrigation system for our soccer field. A retention pond built below the field promotes ground water retention and reduces runoff from our surrounding neighborhood watershed. We have worked with Fish and Wildlife to create a tree boa preserve on our property to protect this endangered indigenous species. Hundreds of pounds of aluminum cans have been recycled on our island thanks to the efforts our student recycling program. Our students participate annually in UVI's Reef Fest - which focuses on marine environmental issues. Reefs are an essential part of a healthy ecosystem in the USVI. Every effort from our community is needed to protect them. Take a virtual tour of our campus below, and see for yourself how we strive to be a truly green school. VIMSIA installed its first solar system in 2007, when a Department of Energy grant was received and a 6KW system was installed. In 2007, solar panels cost $1200 each, today’s price is approximately $200. Subsequently, an additional 97 KW of solar systems have been installed. The total annual cost savings in electricity is approximately $84,000. Upon installation the total system provided 100% of our energy needs. Yet as the school continues to grow we will need to continue to add to our system to maintain our 100% solar energy status. With the installation of VIMSIA’s solar system the Virgin Island’s took note and individual, corporate and institutional solar installations have increased dramatically. VIMSIA created the path for others to follow. Many years ago VIMSIA switched from incandescent bulbs to CFL lighting. (In fact our next move will be to LED bulbs when they become more cost effective.) Yet many individuals and organizations still use incandescent light bulbs on the island. The conversion is one of the most basic actions one can take to reduce one’s carbon footprint. The operating cost of purchasing a CFL mitigates the unit price of the CFL compared to incandescent bulbs. VIMSIA thus strongly supports legislation to ban the importation of incandescent bulbs to help reduce the islands’ carbon footprint. VIMSIA is an advocate for banning the importation of plastic bags into the Virgin Islands. On an island, many plastic bags end up in the ocean, which creates a hazard to marine life, in addition to the environmental damage caused by plastic products in our landfills. Many groups already provide and promote reusable bags as an alternative to plastic shopping bags. However, legislation is needed to force others to adopt this environmentally friendly policy. VIMSIA also sells reusable bags made from recycled materials at its ECO-store. VIMSIA is also working on a program to provide reusable bags to the public, free of charge. We are banning plastic water bottles from campus. VIMSIA commenced recycling aluminum cans many years ago, when some were wondering why we had students handling garbage. 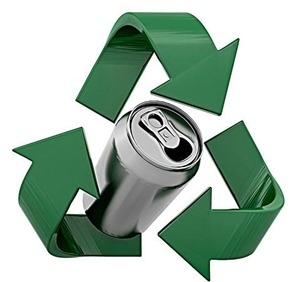 VIMSIA continues to be the leader in aluminum can recycling in St. Thomas. As is traditional in the VI, rainwater is collected from our roofs and stored in cisterns below our buildings to provide a source of potable water. Our system of cisterns eliminates the need to buy water from the government distribution system. VIMSIA has developed several grey water systems to irrigate our campus and to mitigate runoff into the ocean. A 100,000 gallon grey water cistern was built in 2012 to capture water runoff from the campus and surrounding hills. Likewise, rainwater from our solar awning system is collected in a 30,000 gallon grey water cistern. VIMSIA created a retention pond which captures the rain run-off from the campus and surrounding hills to mitigate the dirt run-off into the nearby ocean bay. 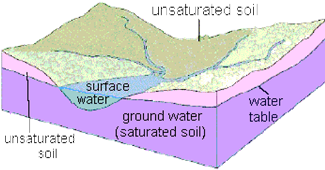 The retention pond captures the muddy water and allows it to filter back into the underground aquifer, thus replenishing the underground water supplies. VIMSIA over the past several years has commenced a major capital development program, expanding the campus from approximately 5 acres to close to 10 acres with many new structures. This area on St. Thomas is a habitat for tree boas, an endangered species. VIMSIA has developed a tree boa conservation program in conjunction with The Department of Planning and Natural Resources. Construction and operations are conducted in coordination with this plan to protect and preserve the tree boa. Over time additional plantings and structures will be created to provide additional tree boa habitats to encourage the revival of the species. The tree boa is not venomous nor harmful to humans. In conjunction with a parent, VIMSIA has built a retaining wall utilizing used tires which otherwise would have ended up in a landfill. The first of its kind in St. Thomas, the tire wall serves several purposes. It creates a barrier for our younger students in the playground area, it serves as a retaining wall to mitigate dirt and rock fall from the adjacent hillside, and it serves as a tree boa habitat. VIMSIA utilized recycled asphalt on its new parking lot, taking a disposal problem and creating a new parking facility. The recycled product is also water porous, allowing water to filter through the paving back into the earth, rather than run off into the ocean. New classrooms are designed with cross ventilation principles to reduce the need for AC units and their energy cost. Screen doors, fans and an abundance of windows are utilized. All roofs are painted white and insulated to minimize heat transfer from our tropical sun. Each class has a garden area on our campus. From the youngest to the oldest, our students manage their own garden areas. They work with soil, germinate seeds, grow flowers, plants, and vegetables. VIMSIA students created a food and recyclable compost system to generate mulch. The end product is utilized in their gardens. Also the IB students have created an organic farm where the demand for their produce far exceeds their supply. Lettuce, cucumbers, pumpkins and herbs are just a few of their produce items. Many of the plants that our honeybees help to foster provide seeds, fruit, and nuts that feed numerous animal species native to St. Thomas. 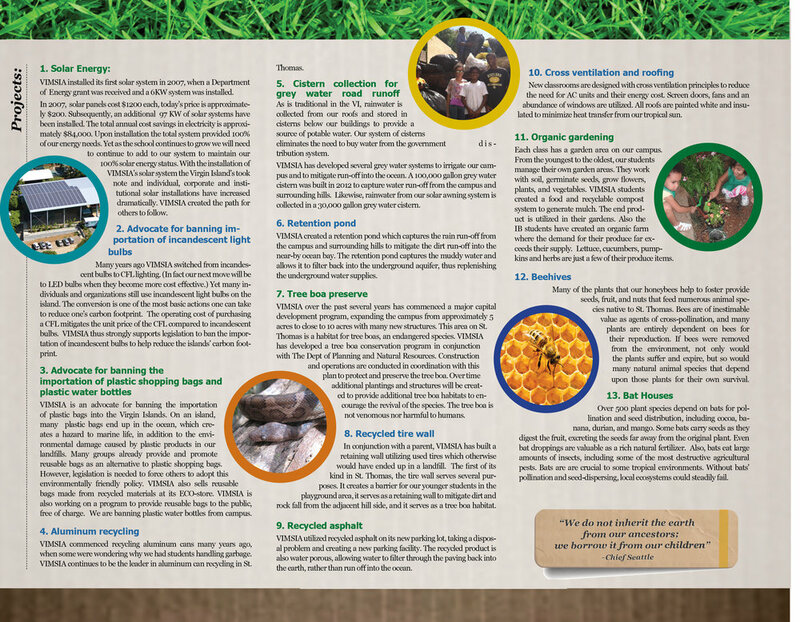 Bees are of inestimable value as agents of cross-pollination, and many plants are entirely dependent on bees for their reproduction. 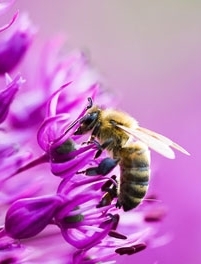 If bees were removed from the environment, not only would the plants suffer and expire, but so would many natural animal species that depend upon those plants for their own survival. Over 500 plant species depend on bats for pollination and seed distribution, including cocoa, banana, durian, and mango. Some bats carry seeds as they digest the fruit, excreting the seeds far away from the original plant. Even bat droppings are valuable as a rich natural fertilizer. Also, bats eat large amounts of insects, including some of the most destructive agricultural pests. Bats are are crucial to some tropical environments. Without bats’ pollination and seed-dispersing, local ecosystems could steadily fail.